I probably don't need to tell y'all that I am way behind on my blogging. 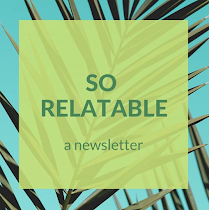 I have a number of things I've been meaning to type up and post (a recipe, two book reviews, a granola give-away and a vacation recap) and those things will happen in due time. I will not say that life has gotten in the way of blogging, because life is the POINT of blogging (for me, anyway). I'll just say that I've been busy and will be back in full force as soon as I can. I am, however, never too busy for writing. (If I keep saying that, eventually it will be true. Right?) Even though I was all over the place last week, I still managed to make some progress on last week's big goal - to "begin something new." I wrote over a thousand words of a new short story, which I'm thinking of as my East Texas Gothic piece. So far, it's very different from my usual style and I'm having fun with it. Writing sessions occurred after a presentation I gave last week while waiting for my ride home, and in the airport while waiting for my flight to Florida. I was very proud of these two writing sessions, because they were in different places and under unusual circumstances. I usually find inspiration in routine, but that can very limiting. I was glad to get outside my comfort zone in more ways than one. Bonus goals: I sent the Dread essay to a blog friend for a read through, finished reading one novel, and started reading a memoir. (I always get my best reading done while on vacation!) Go, me! As for this week, my goals are again simple and direct. Finish my first draft of the East Texas Gothic piece. Write literary reviews for my two most recently read books. 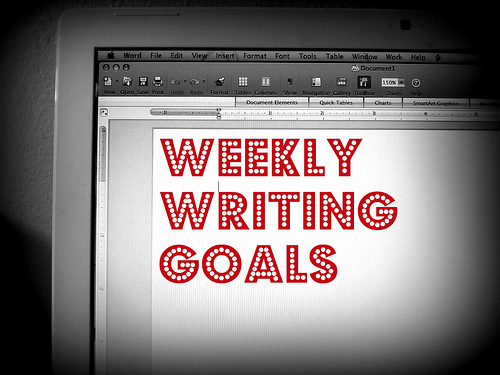 Next week, my goals will be more numerous. When I'm working on something new, I spend a lot of time thinking, stumbling around the edges of the story and revising as I go along. I am very slow at finishing first drafts, but they're usually fairly developed by the time I get to the end. Subsequent revisions are mostly about tightening my language and structure. And now: back to the work that actually pays. More soon.